You may asked what the Unites States did to narrow 350,000,000 people down to Hillary Clinton and Donald Trump as their leader. Keep in mind, this is the same county that at the same time is still mourning the death of a dead gorilla. By around 1:00am ET, the dead gorilla racked up more than 15,000 write-in votes for the presidency Tuesday on election night. Workers in plants run by the largest U.S. poultry producers are regularly being denied bathroom breaks and as a result some are reduced to wearing diapers while working on the processing line, Oxfam America said in a report Wednesday. “It’s not just their dignity that suffers: they are in danger of serious health problems,” said Oxfam America, the U.S. arm of the U.K.-based global development group. The group works for a “just world without poverty” and focuses on topics ranging from refugees in Greece to malnutrition. The report cited unnamed workers from Tyson Foods Inc., Pilgrim’s Pride Corp., Perdue Farms Inc. and Sanderson Farms Inc. who said that supervisors mock them, ignore requests and threaten punishment or firing. When they can go, they wait in long lines even though they are given limited time, sometimes 10 minutes, according to the report. A 51-year-old woman is wanted by police after allegedly leading officers on a high-speed chase in a minivan that resembles the "Mystery Machine" in the "Scooby-Doo" animated television series, according to the Redding Police Department in Northern California. The chase happened Sunday, and although officers have impounded the "Scooby-Doo" van, the woman -- Sharon Kay Turman-- is still on the loose, police wrote in a news release Monday. Police said a Shasta County probation officer first contacted them around 12:50 p.m. Sunday, saying Truman was wanted "for a probation violation" and that she was reportedly operating a Chrysler Town & County minivan. Officers found her in the van later in the day, but she fled, police said. "Turman’s speeds increased and she began to show a blatant disregard for motorist safety," police said, adding that she nearly hit four vehicles. 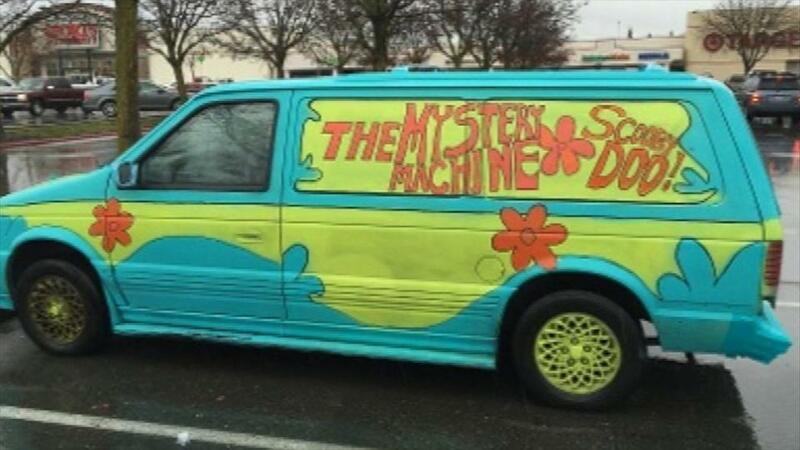 Though police lost Turman, a California Highway Patrol helicopter later found her -- again driving the "Mystery Machine" van, police said. She "fled in the vehicle once again," police said, adding that "her speeds were well in excess of 100 miles per hour." Turman was later "spotted by the helicopter abandoning the vehicle in an area of northwestern Tehama County," police said. Though her vehicle was "located and impounded," Turman's "current whereabouts are unknown."